Is Method Free + Clear detergent the best way to save the world while washing your clothes? Maybe not. VERDICT: not as good as small&mighty. Works at low temperatures. Can help save energy. Not as good as small&mighty. Does work at very low temperatures, so can help save energy. Method "Fresh + Clear" washing detergent rated to work down to 15°C. This review was done done in stages to test it on various wash cycles. We can't do perfect scientific tests with full controls. 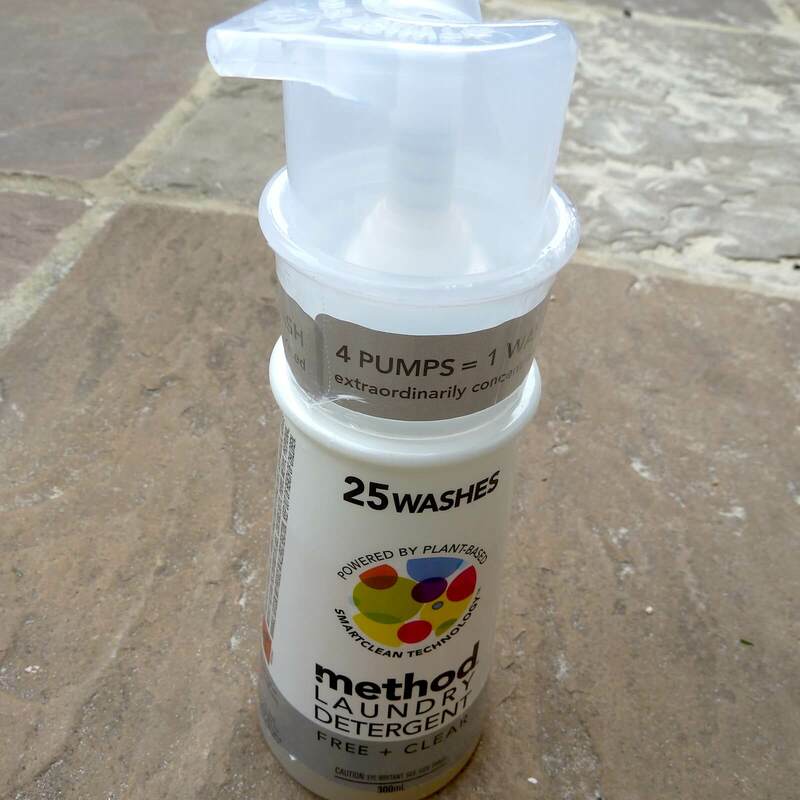 But we can report how Method compares with our other detergents. As of July 2010, the two most common laundry detergents we use are Tesco own-brand tablets, and Persil (Unilever) "small&mighty" concentrated liquid. Both allow low-temperature washes, though the cheap-and-cheerful tablets don't work well (don't even dissolve) below 30°C. The liquid works reasonably down to the 9°C of a winter cold wash.
Like most brands we have done our testing at 15C and above and we are happy with the performance. We would love to hear how you get on at 9C. The packaging for the bottle seemed to be fairly adult-proof. We needed scissors to free up the dispenser top ready to use. Lidl has unashamedly sporadic availability of particular products. For example, we now can't get hold of their good W5 eco dishwasher tablets. Today 2010/08/28 we managed to buy some "Formil small & powerful" 'colour' (non-bio?) washing detergent costing significantly less than 10p/load. It was marked as good down to 20°C, thus nominally only good for cold washes in summer. This detergent also claims to care for the environment and sports the sustainable-cleaning.com badge. So we'll test this against Method and our other usual detergents below. The wash results seemed to be OK.
We used three squirts for a not-very-full load. Unfortunately the detergent failed to remove some marks/stains that we'd expect small&mighty or Tesco to manage, and we're not keen on the fragrance either at the moment! One of Method's pages said "squirt directly onto really stubborn stains," so we will try that another time. Used 4 squirts for a full-ish load of towels. Once each week overnight Sat/Sun when grid carbon intensity is lowest we do a 'maintenance wash' at 40°C or 60°C, usually of towels, as much to get the washing machine clean as the load! Method seemed to do OK, neither spectacularly good nor bad. But the cheapest own-brand detergent will do OK too in these conditions, so you'd have to be very very convinced of the eco superiority over said cheepo to be prepared to spend over twice as much on the detergent, which in turn makes it more expensive than, for example, the 100%-green electricity used to run the load. At this stage my partner vowed to buy no more Method detergent, but I hope that we can at least get to try it in really cold water in winter, and a few others in the interim. Used 4 squirts for a full load. Results OK: some marks didn't come out of a child's bib that we expected to. Used 2 squirts for a half-load, plus some applied directly to stains. Results OK: direct application to (treatment of) some stains/marks did seem to help significantly. I left 30 minutes from applying to marks before starting the wash. Subsequent cold and warm washes have continued to underperform expections, eg compared to our usual detergents. We've seen mixed results from spot application for stain removal, but hanging on the washing line to bleach in the sun seems more effective. We had a major nappy explosion from our younger one, so we chucked all his heavily-soiled clothes (plus some others waiting) with 4 squirts for this nasty half-load, on the maximum cold wash cycle (cottons, non-proportional, extra rinses), and it all seems to have come out pretty clean. Our first couple of (cool/cold) washes with Formil at 10p/wash seem to be matching the performance of the Tesco/small&mighty/Method. During our Sunday lunch, a top and a pair of jeans received significant grease stains, which we immediately spot treated with Method and washed cold ~19°C. Significant staining was still evident after the clothes had dried on the line. We re-washed cold, spot treating the stains with small&mighty this time, and the stains completely disappeared. So, another mark against Method I'd say. In December (2010) the inlet mains water temperature has been significantly below 10°C, and Method has performed satisfactorily in a cold wash. This suggests that Method can indeed be part of an energy-conserving wash throughout the year in our part of the world at least, which is good! Photos of Method 4x concentrated eco-friendly content and packaging. Method Laundry and the fresh air product. 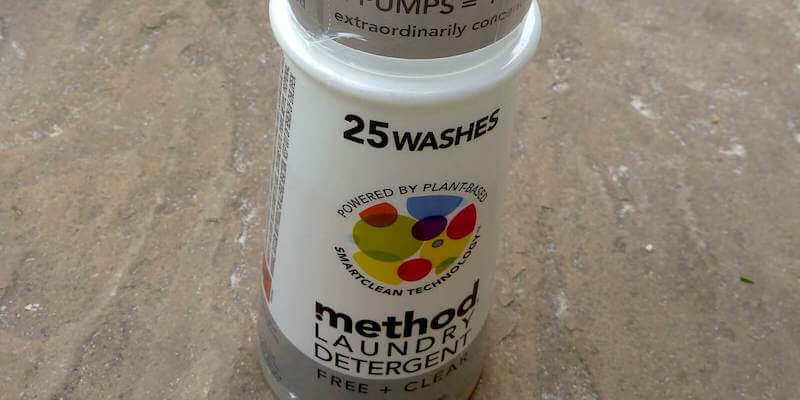 2010/07/20: Method Laundry Detergent's Radical Innovation Wins International Design Excellence Award (TreeHugger). First published 2010-08-02 , updated 2019-04-22 . Site copyright © 2007-2019 Damon Hart-Davis. Hosted by ExNet.